Microsoft Mathematics is a full-featured scientific graphing calculator that’s designed to work just like a handheld calculator that provides formulas and equations library, a triangle solver, a unit conversion tool, ink handwriting support. 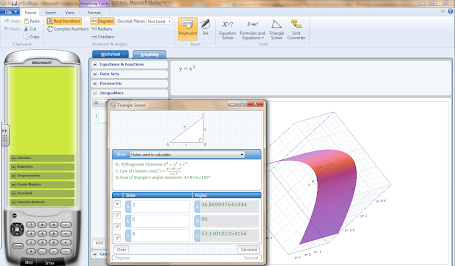 Microsoft Mathematics provides a set of mathematical tools that help students get school work done quickly and easily. Microsoft Math software was designed to help student to learn to solve equations step-by-step, while gaining a better understanding of fundamental concepts in pre-algebra, algebra, trigonometry, physics, chemistry and calculus. Additional math tools help you evaluate triangles, convert from one system of units to another, and solve systems of equations. Microsoft Mathematics graphing calculator can plot in 2D and 3D, step-by-step equation solving, and useful tools to help students with math and science studies. Microsoft Mathematics provides step-by-step solutions to many types of problems, from simplification of algebraic expressions to solving systems of equations. If a step-by-step solution is available for an expression, you will see the heading "Solution steps" between the input and output expressions in the output pane. Click the heading to show the step-by-step solution. A mathematical expression is any combination of numbers, variables - a symbol that represents an unspecified or unknown quantity, such as "a," "b," or "x", operators, and functions - a mathematical relationship between variables in which the value of one variable determines a unique value for another variable. For example, a number such as 17 is a mathematical expression, as is the variable x, and the combinations x+17, sin(x), and x² - 3. You can enter mathematical expressions by using the mouse, the keyboard, or using ink. The calculator pad includes a number pad and the following button groups: Complex Numbers, Calculus, Statistics, Trigonometry, Linear Algebra, Standard, and Favorite Buttons. The Worksheet tab, displayed by default, is where you'll probably do most of your numerical computing. This tab includes an input pane and an output pane. You can use input mathematical expressions by using the keyboard, mouse, or ink input. When you complete the expression, Microsoft Mathematics evaluates it both symbolically and numerically (if applicable), and then displays the results in the output pane. In some cases, the output may include step-by-step solutions or additional information about the solution. The Graphing tab can be used to create most mathematical graphs. This tab includes an input pane to enter the function, inequality, data set, or parametric equation (an equation in which values to be plotted are expressed as functions of underlying parameters) that you want to plot. To work with the graph after you plot it, the Graphing tab also includes a pane that describes what is plotted in the graph, and a graph pane that displays the graph.